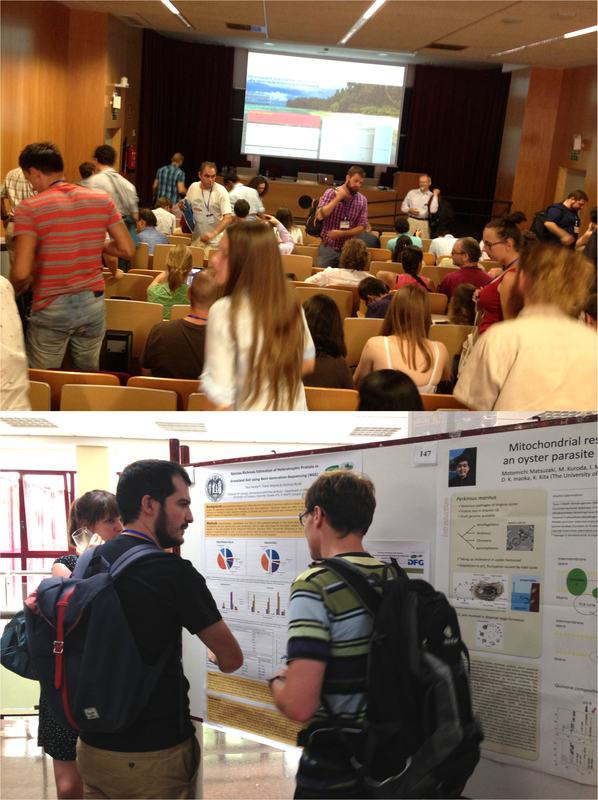 Joan Strassmann (left) and Avelina Espinosa (right) discussing kin-recognition in unicellular eukaryotes (protists) at a symposium organized for the purpose at the ECOP-ISOP 2015 conference in Seville, Spain. SEVILLE, SPAIN (EvoLiteracy Sep. 9, 2015) — Organized by ECOP-ISOP, the protistologists’ meetings always surprise me, not only because I must pinch others to remind them that unicellular eukaryotes, or “protists,” are the stars of these annual conferences, but also because like no other scientific gathering, these events attract world specialists who share passion for organisms that look –and are– single celled. That’s it; all distantly –and some more closely– related groups of “unicell” creatures that populate the Earth, and in all environments. The evolutionary concestors of animals, plants and fungi. I have attended these meetings during the past five years: Kent, UK 2010; Berlin, Germany 2011; Oslo, Norway 2012; and Banff, Canada 2014. I missed the 2013 reunion in Vancouver, Canada, which I had no alternative but to trade it for the World Evolution Summit in the Galapagos. 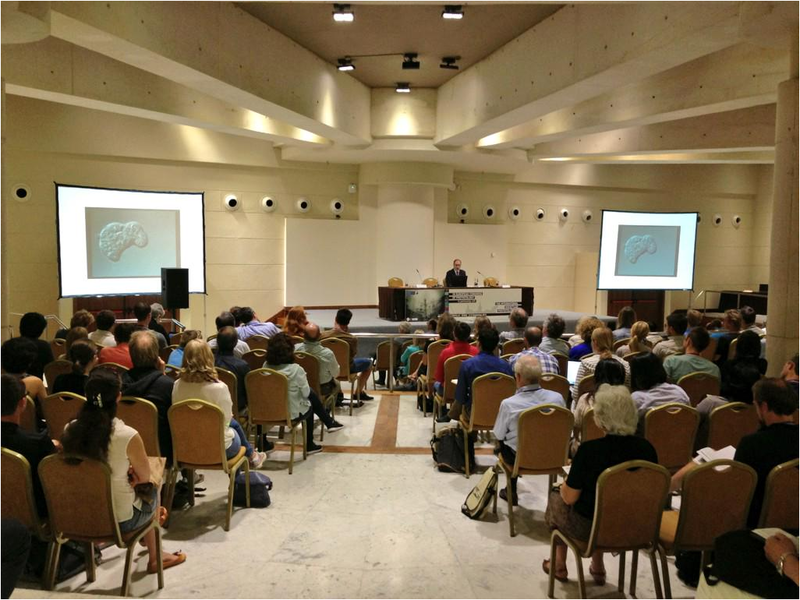 Plenary session on Cryptic Diversity in Organisms and Organelles, ECOP-ISOP 2015 meeting in Seville, Spain. 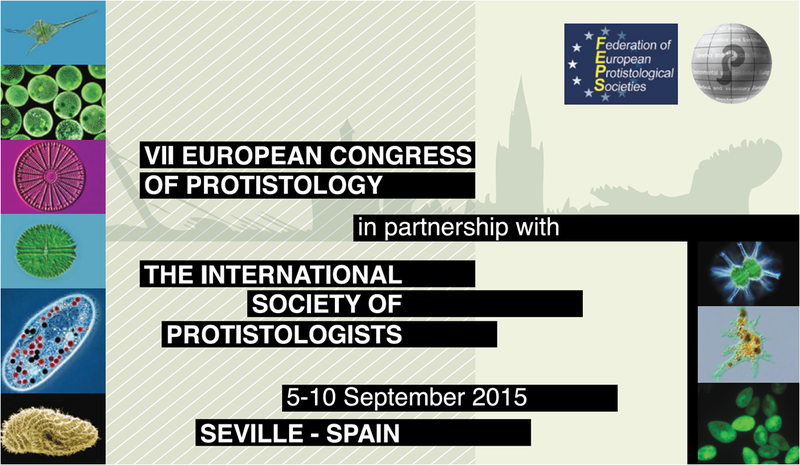 The ECOP-ISOP (European Congress of Protistology – International Society of Protistologists) meetings will run September 5-10, 2015, and the sessions will take place at the Reina Mercedes Scientific Campus of the University of Seville. The format will include plenary lectures, symposia, workshops, and posters (mostly by graduate students). 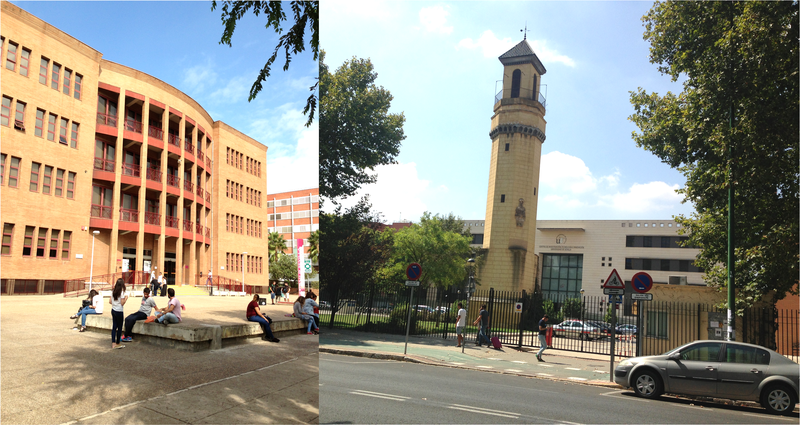 The Reina Mercedes Scientific Campus of the University of Seville where the ECOP-ISOP 2015 meeting will take place from September 5th to 10th. Top: Phylogeny and Evolution presentations just ended, today, September 9th. Bottom: Poster session discussions, a friendly setting for one-on-one (or two) interactions. 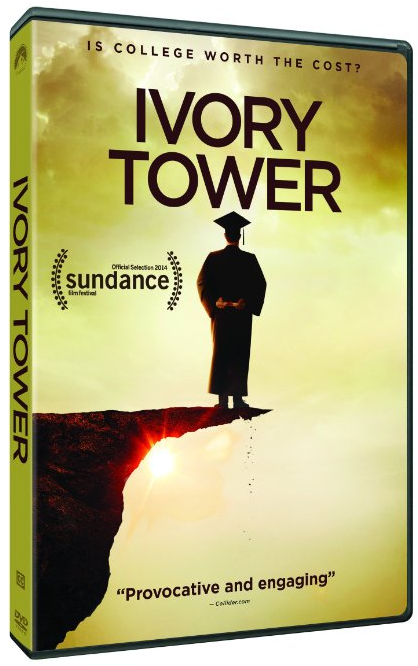 The current for-profit model of higher education in America is destined to crash. 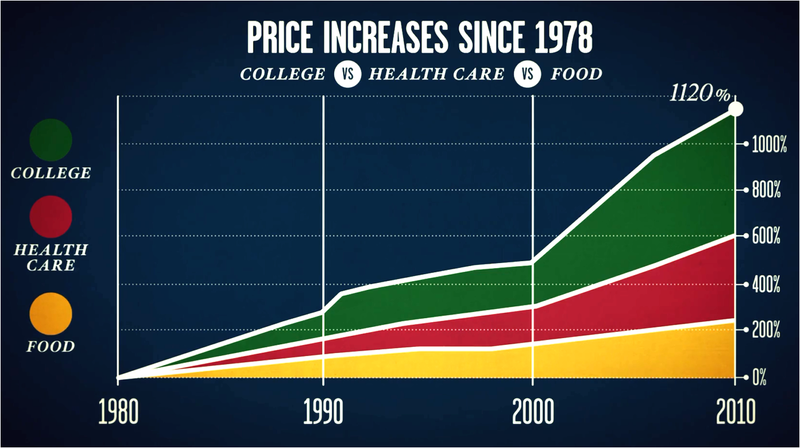 Its failure will injure primarily the students, today’s borrowers of $1.19 trillion. What for? Mostly tuition and collateral life expenses in exchange for an overpriced degree. If the quality of higher education had improved parallel to its fees, then the argument for an overcharged college certificate would be unsound. Now, education is expensive and its alternative, ignorance, would be more damaging in the long term. But, how expensive should education be to justify its actual cost? By 2015, the total debt balance in the U.S. reached $11.85 trillion; 69 percent of it corresponded to mortgages; 10 percent to student loans; and the remaining amount to auto, credit cards, and revolving loans. 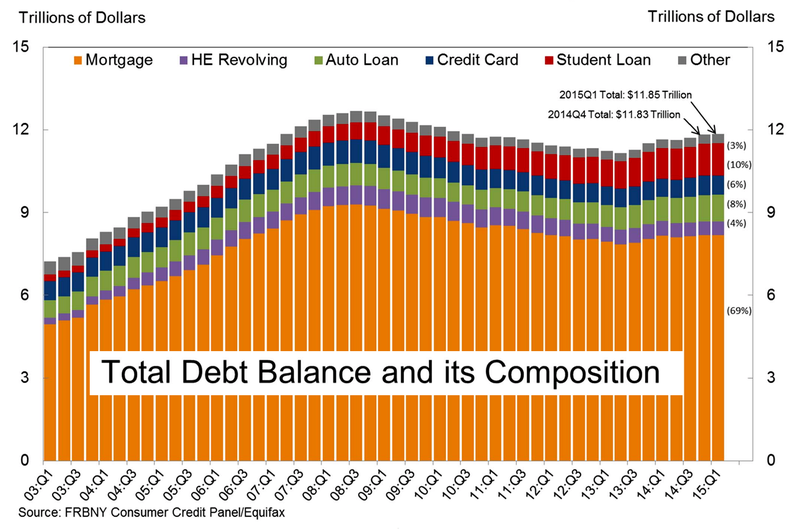 Note how from 2003 to 2015 student loans (red bars) grew significantly in respect to other types of loans. Image source: Quarterly Report on Household Debt and Credit, May 2015. The race among higher-ed campuses to capture the funds available to students for education is self inflicted, a textbook example of out of control free market competition, in which education is a commodity, rather than a priceless investment in culture, the ultimate possession of a nation. About 40 million Americans are borrowers of student loans, two million of them currently owing at least $100,000. But the situation is complex and a distinction must be made between undergraduate and graduate student loans. Sixty percent of the $1.19 trillion debt belongs to the undergraduate students. The technicality here is that the remaining 40 percent of the balance corresponds to 14 percent of the borrowers, who are graduate students. Thus, the per capita obligation is much higher for the latter. In either case, the responsibility to pay back is substantial, although the assumption has been that post-graduate degree holders shall be reliable payers, and not flock toward debt-forgiveness programs. A risky supposition considering that since 2007, when such initiatives started, additional rescue plans emerged, including President Obama’s 2012 Pay As You Earn. The forgiveness paths facilitate government agencies, nonprofit organizations, and the private sector to hire debt-borrowers to work for a reduced salary and, in return, benefit society by taking public-service roles during a prearranged period. Other alternatives, like the President’s debt relief law, include the capping of monthly payments at 10-15 percent of the borrower’s discretionary income, thus lessening the stress while carrying the loan over time. Despite these damage control policies, the national student debt is, in foresight, a time bomb. Its societal sequels will unveil in a few years. As The Wall Street Journal characterizes it: “offering unlimited loans to students, with the prospect of forgiveness, creates a moral hazard by allowing borrowers to amass debts they have little hope or intention of repaying, all while enriching institutions and leaving taxpayers to pick up the tab.” Sounds comparable to the mortgage transactions of the 2000s, which benefitted financiers but turned unmanageable for home-owners wannabes. 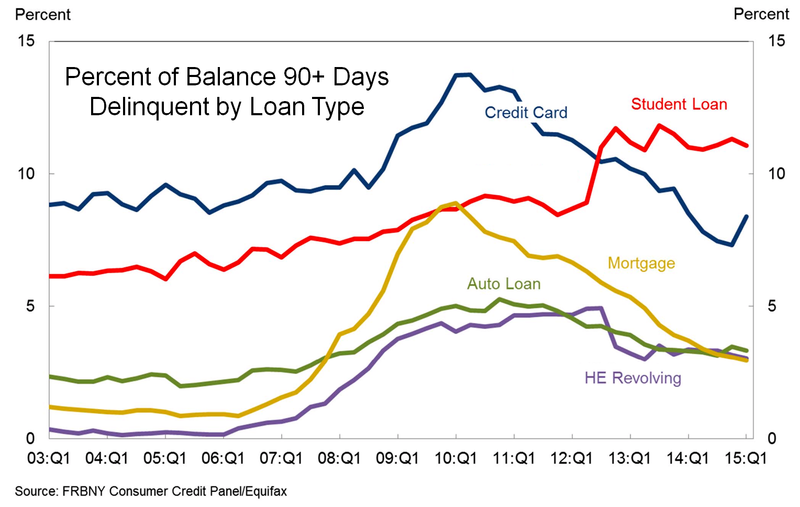 By 2015, student loans reached the highest percent of balance 90+ days delinquency in contrast to credit card, mortgage, auto loan and revolving loans. In essence, 10+ percent of student borrowers were not repaying. Image source: Quarterly Report on Household Debt and Credit, May 2015. In 2004, the typical borrower (combined graduate and undergraduate) owed $40,000 upon graduation (undergrads $20,000). In 2012, the latest data processed by NAEPP, the standard student borrower owed $57,000 (undergrads $25,000). These are median values, which convey fractional information: one in every ten borrowers owed $153,000 once graduated. These figures varied according to field of expertise and as per typical borrower: $161,000 among those graduating from the medical and health sciences, $140,000 from law school, $58,000 from a master of arts program, $50,000 from a master of science or education, and $42,000 from a master in business administration. 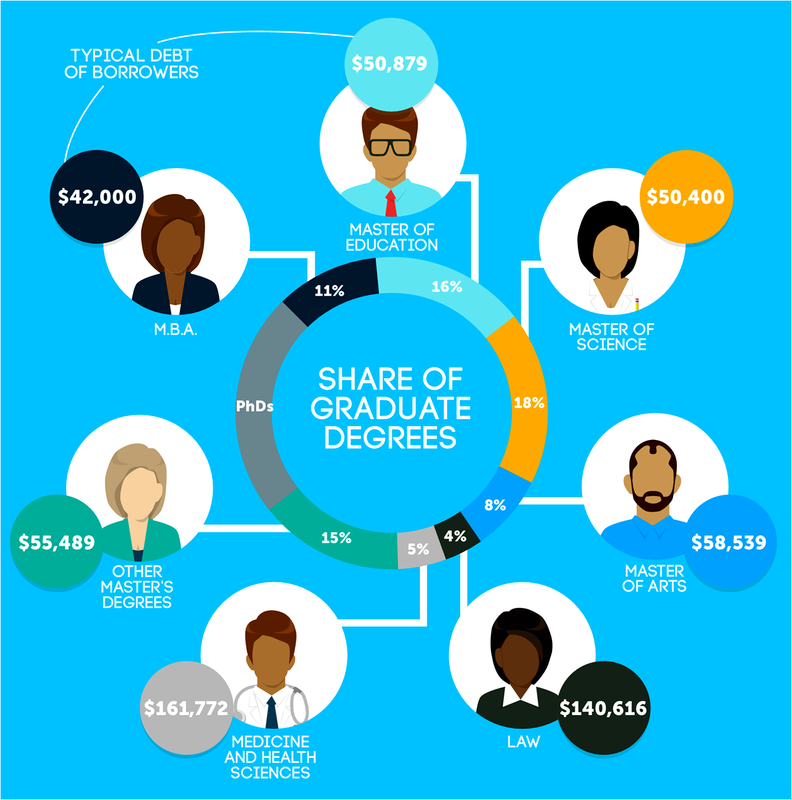 Typical debt of borrowers (share of graduate degrees). Source: New America Education Policy Program, March 2014. 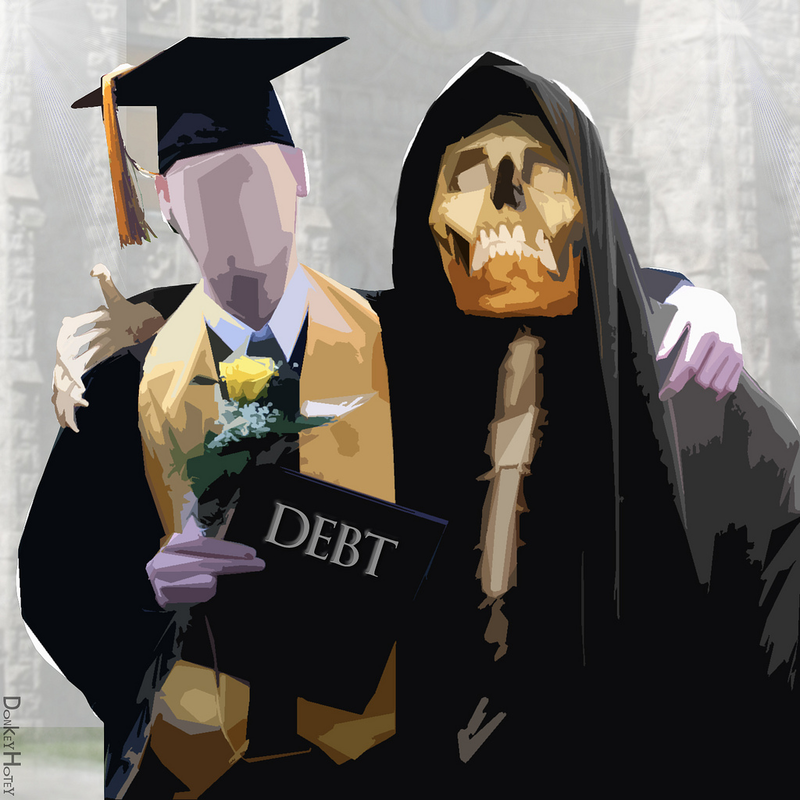 Among the in-debt, the typical monthly payment, at a 6 percent interest rate and 15-year repayment term, was: $1,365 among graduates from the medical and health sciences, $1,187 from law school, $494 from the arts, $429 from science or education, and $354 from business administration (values adjusted to 2012). On the administrators’ side, in contrast, the finances have been blooming. The top ten U.S. public college presidents‘ earned, in 2013-2014, from $1.5 million to $745,000, while their top five counterparts at private colleges made from $7.1 to $1.8 million in 2012. 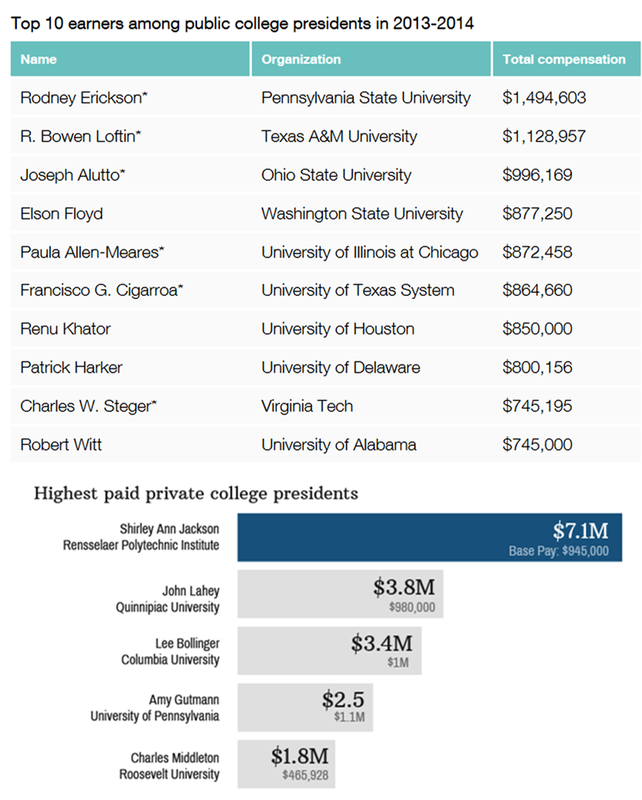 Top: highest paid Presidents at public colleges in the United States. — Bottom: highest paid Presidents at private colleges (smaller numbers in histogram = base pay salaries). Data from The Chronicles of Higher Education (see summarized list in Business Insider). 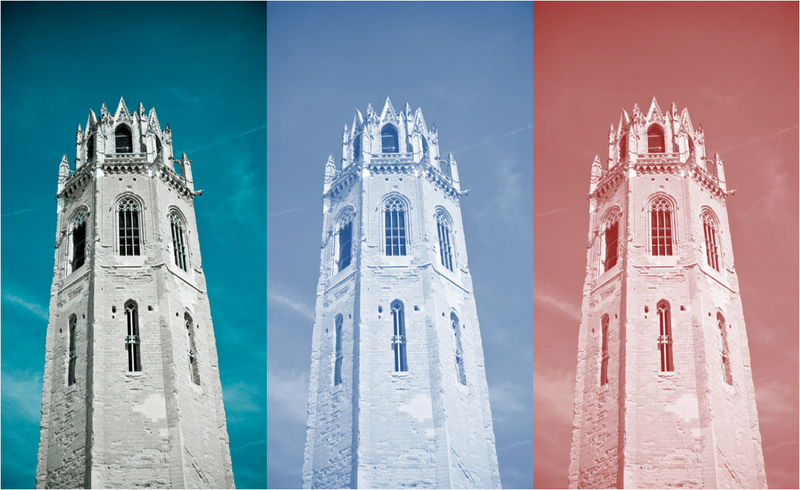 The breakdown of the Ivory Tower is figurative in the architectonic sense, but not in the intellectual. The present generation of student borrowers is fated to limited socio-economic mobility, to be trapped in an unsustainable system in which, as customers, they demand satisfaction, rather than proper schooling. Education does not need to be cheap, just affordable, sincere. Not vibrant entertainment. — © 2015 by Evolution Literacy all rights reserved. 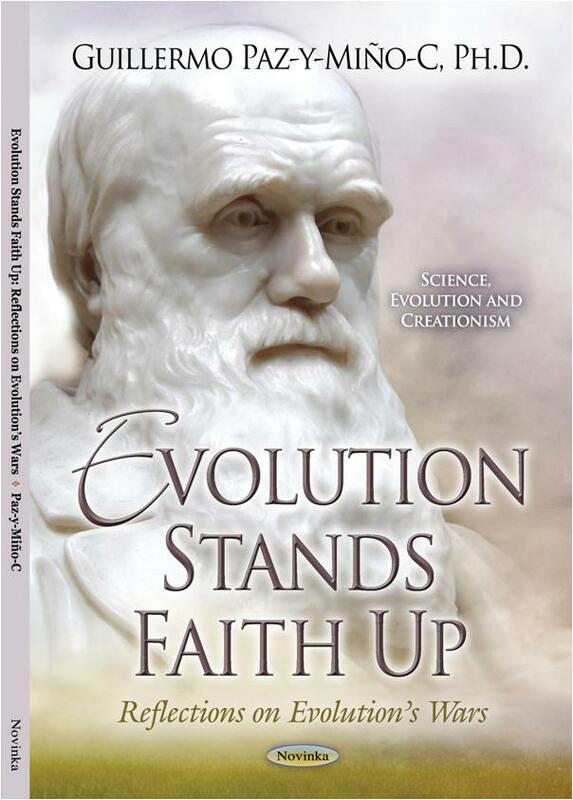 Evolution Stands Faith Up: Reflections on Evolution’s Wars By NOVA Publishers, New York Soft Cover. Find it at Barnes & Noble, Amazon.com, Amazon UK. “This is an inspiring, readable collection of essays of reflective value to everyone. Paz-y-Miño-C points to the vain attempt by many to try and accommodate scientific rationalism with supernatural beliefs. They are simply incompatible. The author has a marvelously eloquent style of writing, full of inspiring metaphors and lateral observations that reinforce connections to the foundations of scientific inquiry and to biological evolution in particular. These thoughtful essays… are inspiring… [and] help clear the fog in our communities and arm our neighbors [with arguments] against theistic anti-science, medical quackery and other irrational nonsense.” – Greg M. Stott, PhD, Geoscientist with the Ontario Geological Survey, Canada. “Paz-y-Miño-C doesn’t ask the reader to ‘believe’ in evolution. He provides overwhelming evidence, clearly written, that shows how scientific inquiry leads to important and practical results, while superstition and faith lead nowhere. Although we may not be able to reason someone out of what they were never reasoned into, the author presents a roadmap for those whose minds are open to discover the wonders and beauty of science.” – Herb Silverman, PhD, author of Candidate Without a Prayer: An Autobiography of a Jewish Atheist in the Bible Belt. “Too many of our colleagues work so hard to appear open minded that their brains seem to have fallen out. When they teach our students that they can pick and choose when to be logical, critical thinkers, they are modeling the type of reasoning that leads to the politics of convenience and its bridesmaids: racism, sexism, and the whole host of xenophobias. Paz-y-Miño-C is a prolific essayist, he does not pull any punches, but when he cuts to the core of an argument, he does it with the flare of a true artist.” – Stan Braude, PhD, Professor of Practice in Biology, Washington University in St. Louis, USA.